West Bengal NEET Counselling 1st Round Seat Allotment: Health & Family Welfare Department, Government of West Bengal has published NEET 1st round state counseling seat allotment result on 5th July 2018. The result is available on the official website of WBMCC as per the schedule. All candidates who have filled the registration form and locked their choices are able to check their seat allotment result. The online pre-counselling registration form was available from 19th June to 24th June 2018 on the official website of West Bengal Main Computerised Counselling (WBMCC). All candidates who are willing to participate in West Bengal state quota and Management Quota counselling 2018 have to log in the website www.wbmcc.nic.in and fill the registration form and have to pay counselling Fees (which is non-refundable) online Rs 2000/- for unreserved category candidates and Rs 1500/- for SC/ST/OBC A/OBC B/PH candidates. Bank transaction cost extra to be borne by the candidate concerned. 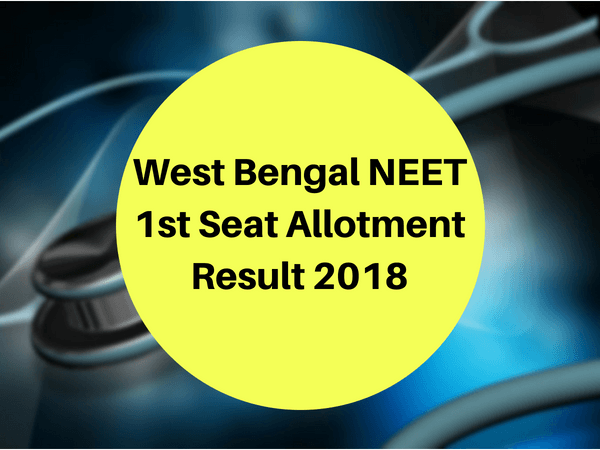 Quick Update (5th July 2018): West Bengal NEET 1st Round Counselling Seat Allotment Result 2018 has announced today. All candidates can check their seat allotment result from the below link. List of Important Document For VerificationCandidates can verify their documents at RG Kar Medical College Kolkata/ Medical College, Kolkata/ IPGME&R, Kolkata. Remember, Candidate has to appear physically for the verification at the verification centers. Below we have listed all necessary documents that candidate has to bring originals and self-attested photocopy. PH certificate issued from IPGMER Kolkata (From Medical Board which started from 19th June 2018).